I was surrounded by wonderful art last week, and helped many people make art selections for their homes. In the art frame of mind, I paid close attention to the magnificent art in the various houses of Downton Abbey when I was catching up on past episodes last weekend. In particular, I admired the way in which much of the art was hung in a European stacked manner (often from chains anchored to the molding), which allows for several paintings to be hung on one wall. These are not paintings that are created as a series by the same artist, or a series of matching items like intaglios or antique prints. 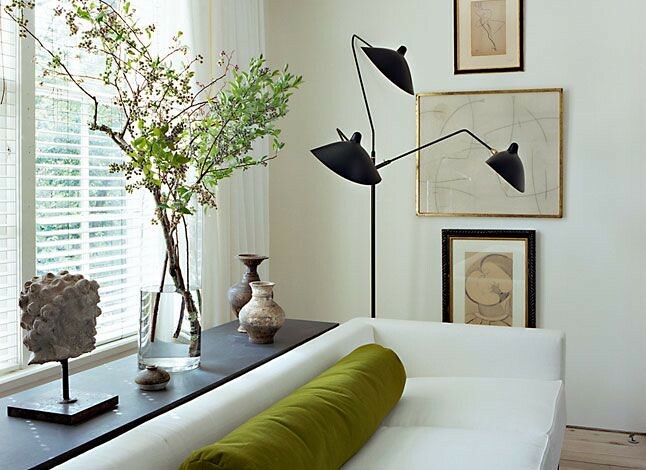 And they are not quite gallery walls, where there is a collection of framed items hung in an asymmetrical grouping. Rather, they are paintings that have been collected through the generations, and the placement of the paintings is just as much of an art as the paintings themselves. Often the larger painting is hung above a smaller painting. 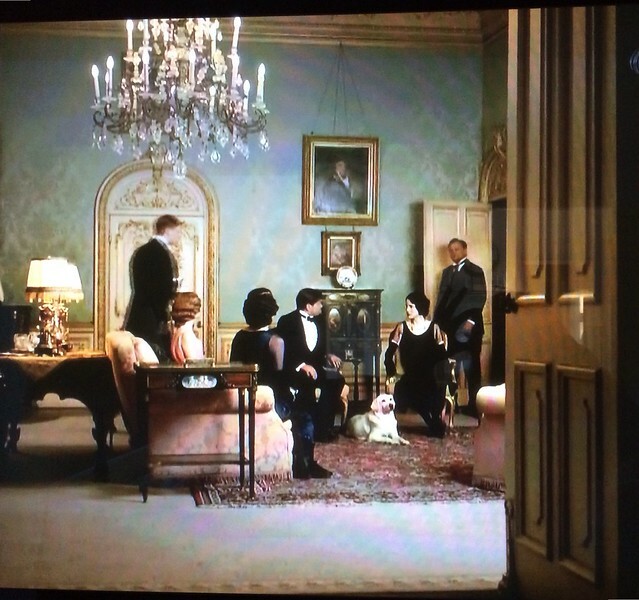 A scene from a recent Downton Abbey – note the way in which the paintings are hung from chains. As a side note, this is truly a magnificent chandelier; I admire it every time there is a scene in this room. 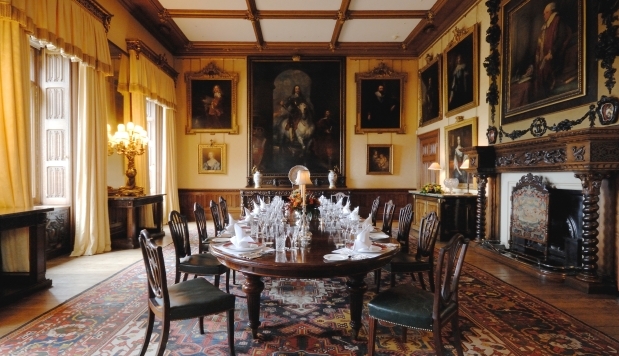 The dining room at Highclere Castle, where Downton Abbey is filmed, also has a collection of paintings hung in a stacked manner, small under large. King James Library, Hatfield House makes the décor at Highclere look minimalist (image source). 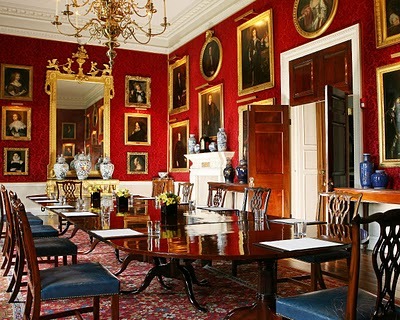 The dining room Althorp House, Princess Diana’s family seat, features many portraits made through the centuries, hung in a classically European style. A richly colored library with stacked paintings, hanging from brass poles hung at the cornice. Of particular interest are the smaller paintings on the left side of the picture, four linked together with chain. 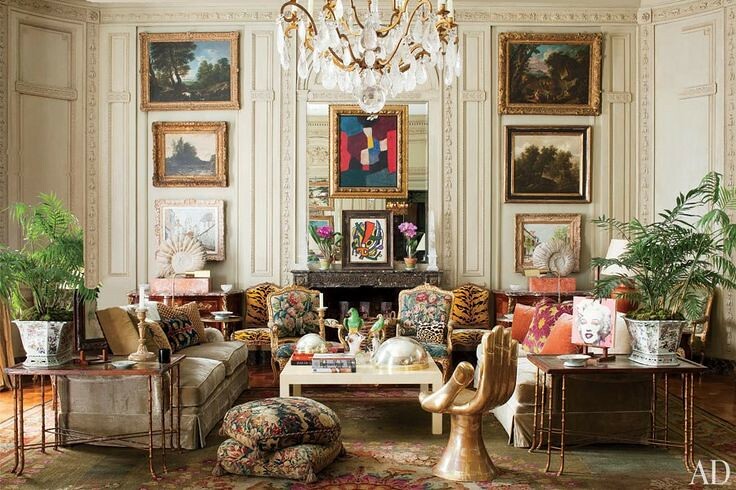 A gorgeous Parisian apartment with paintings hung one over another (and hung by a brass chain). 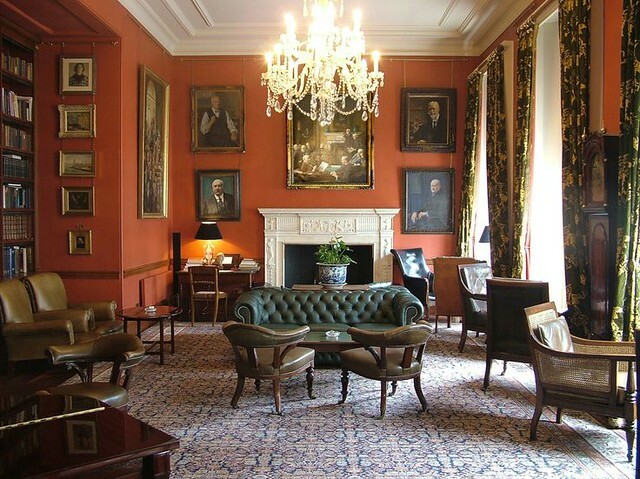 I found a wonderful post on The Devoted Classicist about the European hanging style, which focused on the “master in the arrangement of pictures” - Alec Cobbe, a painter-designer-musician who lives at Hatchlands Park, a National Trust property in Surrey, England. Click here to see the article, I thoroughly enjoyed it. 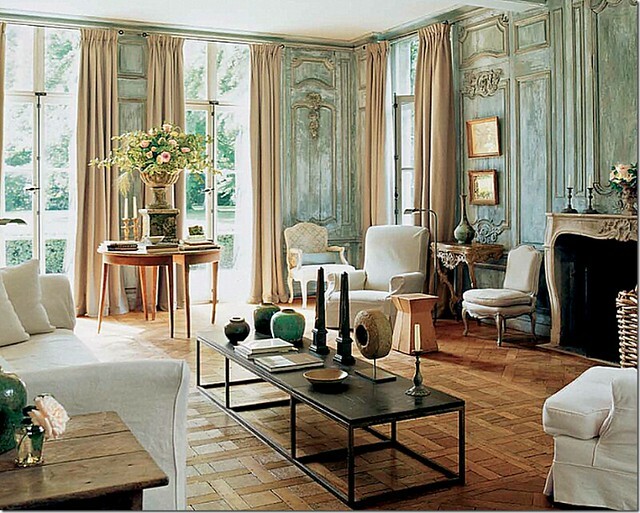 The image is from the post, originally from a March 1996 article in Architectural Digest. 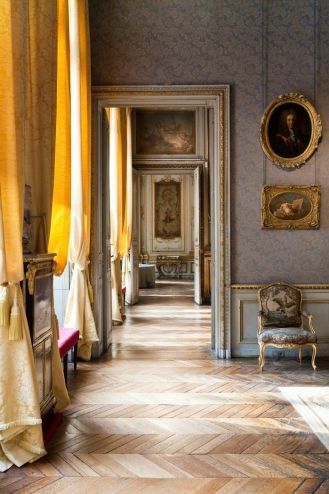 I found many modern day examples of hanging a grouping of paintings in a vertical stacked manner, including this exquisite image in a room attributed to Jacques Grange. Note how the paintings in the corresponding position on each side have a thematic similarity. 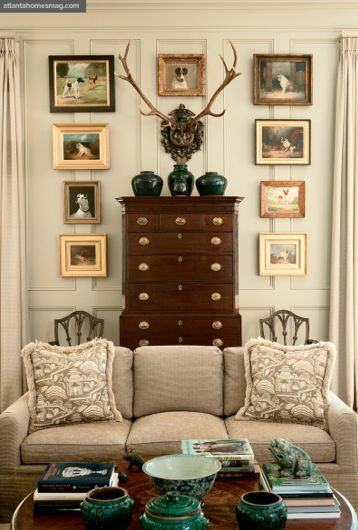 Reminiscent of a gallery wall, but note the orderly and linear manner in which the pictures and paintings are hung. Someone with a great eye and a talent for the art of picture hanging created this arrangement. It appears to be a collection of dog paintings in varying shapes and sizes. 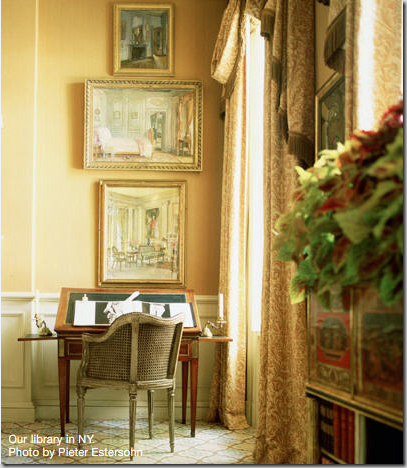 One of my favorite rooms ever published in Veranda; I see something new every time I look at it. 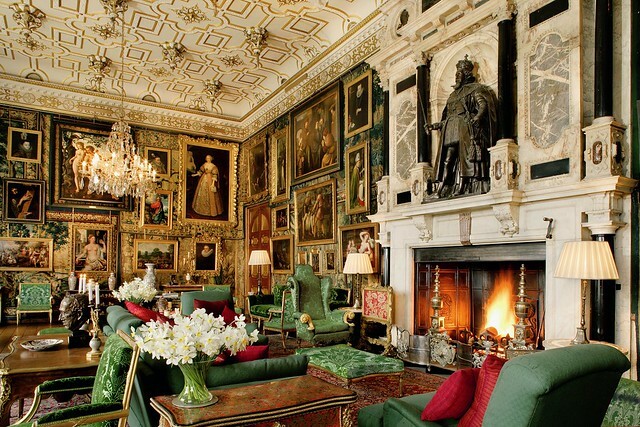 Note the paintings hung to the left of the fireplace. A closer view – I like how the top painting is slightly bigger than the bottom painting. 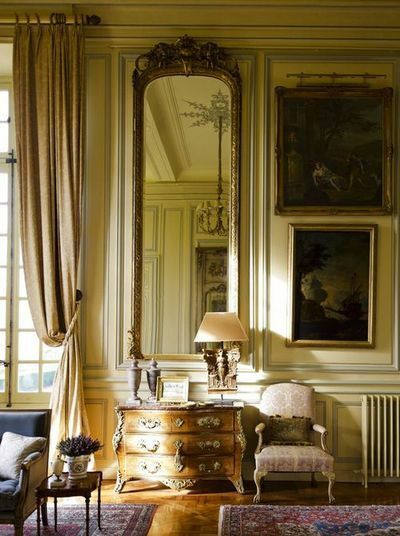 A beautiful vignette from a French chateau. 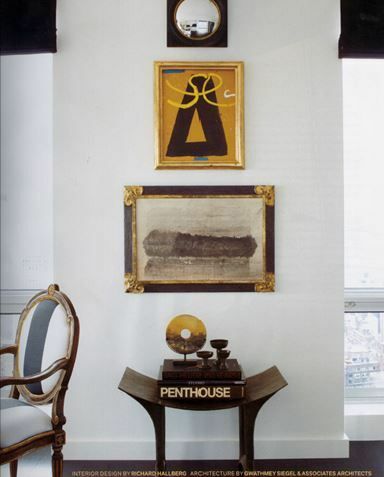 Note how the top painting is hung from a brass rod, but the bottom painting appears to be hung directly on the wall. The perfect place for a collection of small oil paintings. hung in a stacked manner – a wonderful collection and a great way to display it. A beautiful vignette of contemporary paintings and a mirror stacked on a small wall. Interior design by Rochard Hallberg. There is such a beauty to the arrangement of these paintings, and the fact that it takes the art from floor to ceiling. Design by Betsy Brown. Very traditional paintings (stacked with larger one over smaller one) and a modern console. 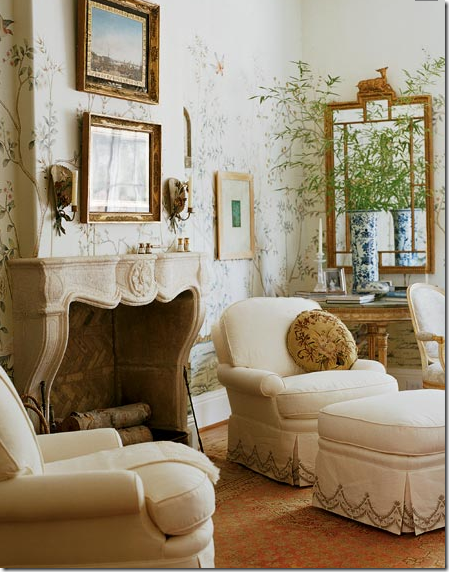 This is a gorgeous vignette – found on Pinterest – I would love to know the designer. 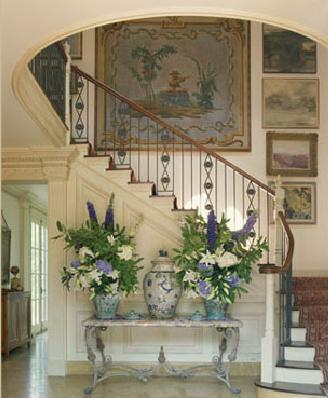 A stunning stair hall by Joseph Minton – the tall grouping of paintings on the right is perfect in the space, taking the art all the way from floor to ceiling. 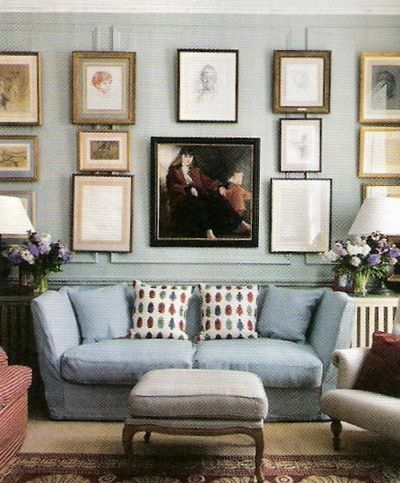 A pretty vignette of stacked paintings and a settee. 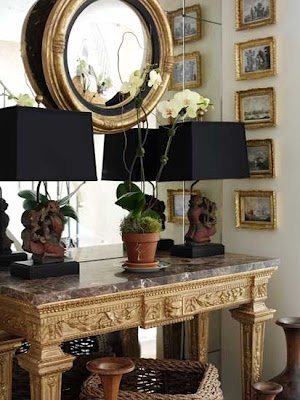 I have used this picture on my blog when I was selecting a mantel, and now the stacked paintings above the mantel catch my eye. Design by Cathy Kincaid. 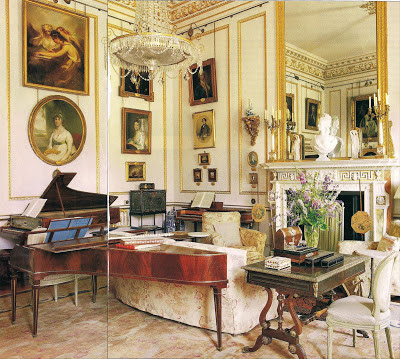 A classic arrangement of interior paintings, in a room designed by Charlotte Moss. 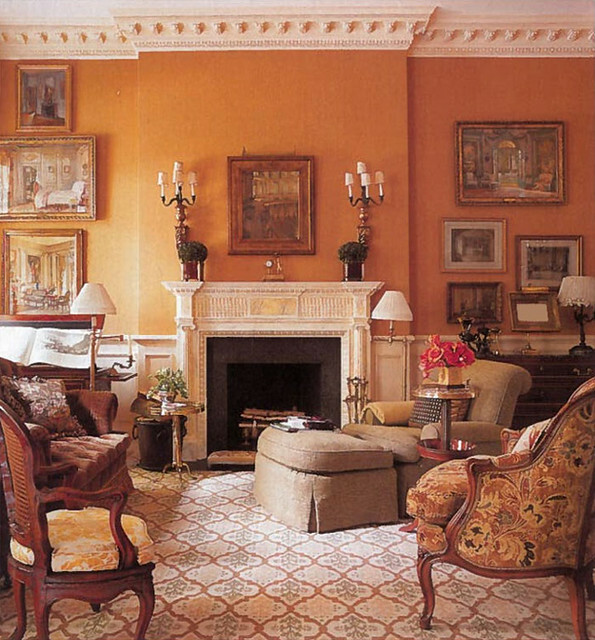 A wider view of the same room (although one the images was flipped) shows how the stacked paintings are offset by a more asymmetrical gallery wall on the right side of the fireplace. To me, this speaks of a collection that has been gathered over time, perhaps by different artists but reflecting a love of interior paintings. All of the paintings are framed uniquely, but with a similar burnished gold that makes the arrangement cohesive. It’s a beautiful look. A favorite image found on Cote de Texas last year – if you look closely, the paintings are hung in a very linear manner from top to bottom. I truly appeciate every picture in this post, and love the look of art hung in this manner. I always wonder how the home owners and/or designers were inspired to hang the art in this manner. With the old English houses, I suspect it was to make room for the collection of a generation – hanging in a stacked manner certainly maximizes the number of paintings that can be shown in a space. But what about the modern spaces? Do homeowners and/or designers find the paintings individually at one time, and then group them? Or maybe the collections come together over time and then get grouped when the homeowner moves or is inspired to redecorate? What do you think? I would love to create a wall similar to the last image, but I wouldn't even know how to start. Fabulous feature Holly, and you show that there are truly numerous ways to display works of art! Great post! It gave me pause and I am reflecting on the way I have hung the art in my shop. I also have an art rail and I typically put the larger art on the bottom, smaller on top. I am inspired to change things up! Such a great and helpful post, Holly! I have never thought about hanging paintings in this way. Always enjoy your posts, Holly! Very thoughtfully put together. Would love to know how you feel about family photos displayed in the home. My husband prefers them in the halls. I like them scattered about. Any thoughts? Great post, Holly! I will need to revise and reverse some of the arrangements in my house. I had not arranged them as thoughtfully nor had I researched how to hang my small groupings. This is one of my all-time favorite posts! Marvelous! Rich in subject, images, knowledge, and remarks. Thanks very much! 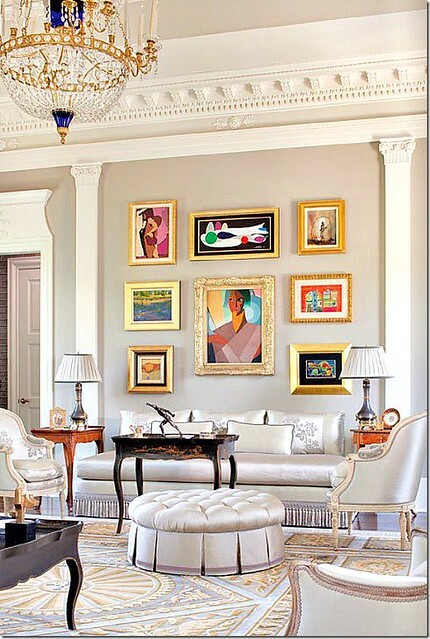 Absolutely love this post, all those stacked and gallery walls look gorgeous!!! Such a wonderful post! So much great information. This collection of images are amazing. I love the brass rods and the chains. It lends such an elegance . As I've gotten older, I've developed such an appreciation for landscape oils. How I would love them in my house!! Good morning! 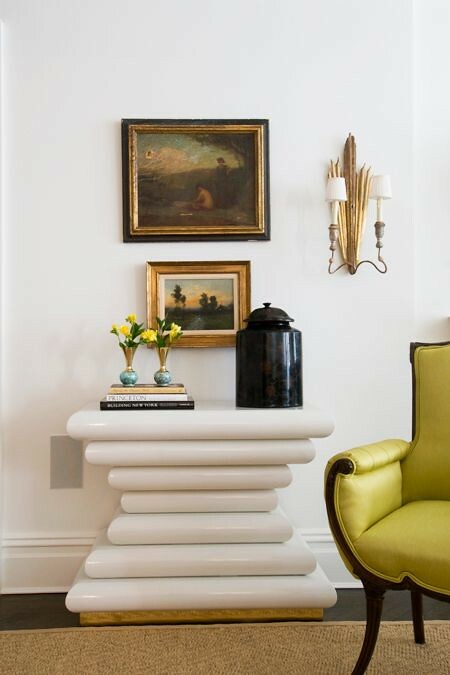 I'm pretty sure the designer in the image you were interested in knowing (modern console & chartreuse chair) is Melissa Rufty in New Orleans. Here is a link to her website http://www.mmrinteriors.com/projects. I love her work. 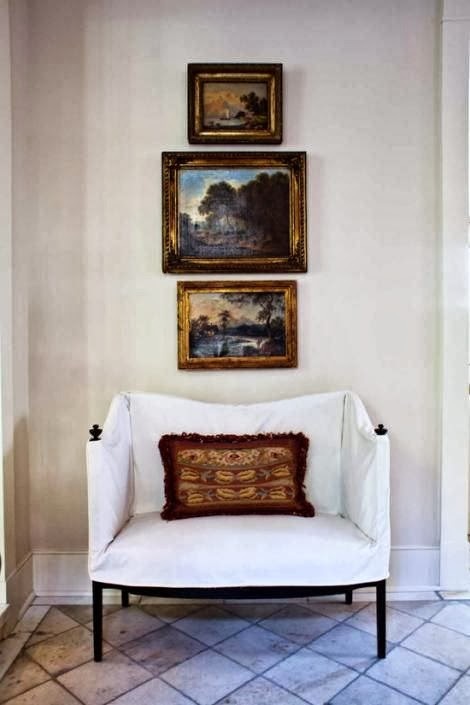 Interesting placement of single large pillow in settee below the 3 stacked paintings. The pillow acts as extension of the paintings. What beatiful images of all of the European hanging styles! Oh my, what a fabulous post!! I literally have been working on the same post.. I am fascinated by stacked art! I have fantasized about doing it in my own home.. but I just don't have the wall space! Just loved all of it>> gives me hope as I have an angled wall with one piece of art in the center- which is 31x38, i want to place one more piece on each side of it- the one on the left will be 23x30 and the one on the right will be 24x42, same artist, simlar subjects ... now to deciede how much of on angle to use for the hanging of these other 2 pieces due to the angle of the wall/roof line... open house, very little wall space for stacking. We will be building a new house within the next 2 years , a timber-frame on on of the Southern Gulf Islands- off the coast of British Columbia; and that house is very open as well; going have to stack around the fireplace.. if it stays where it is ..
What great examples, large room or small, the art can make the room smile. Loved this post. Great post! I love stacked art and have been able to use that method in several areas of my home. I noticed in one of the images that pictures were hung in a paneled room with the frames spanning the molding from each individual panel rather than hanging inside the panel. How do you feel about this method ? I have a nice collection of antique botanicals that I would like to hang in a paneled dining room and because of their size would have to hang them this way. Also, are there new rules for hanging paintings or is it still at eye level and what height would that be for the average person? Hope you can answer. Such a fabulous article! I especially love the foyer arrangement which gives me hope about arranging paintings in our own foyer. The link in the Alec Cobbe article to Mad About Interiors blog was also wonderful. Thanks for your hard work in putting this together!